*You may also click your county on the map below to jump directly to it in the directory. Law enforcement agencies listed in this directory are departments which report offense and arrest information to the Division of Criminal Justice Services under the Uniform Crime Reporting or Incident Based Reporting programs. County-specific agencies in New York City are listed under the county headings of Bronx, Kings (Brooklyn), New York (Manhattan), Richmond (Staten Island), and Queens. 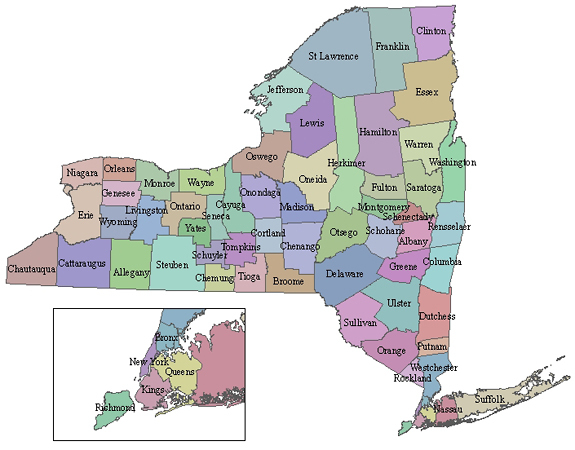 For New York State Park Police, and Environmental Conservation Police regions, contact that agency's central office for counties of jurisdiction. A listing of town and village courts can be obtained from the Office of Court Administration Website. If you are aware of needed changes in the Directory, please call DCJS at 518-457-5837 or 1-800-262-3257. You may also advise us of changes by e-mail at: pressinfo@dcjs.ny.gov.